In this tour, we will visit the Nandi hills which forms one of the major attractions of Bangalore. Explore the ancient temples of Bhoganandeeshwari temple & Lepakshi temples. See the huge Nandi Bull - the largest monolithic structure of India. The driver will pick up the guests from the hotel or residence as provided while booking. 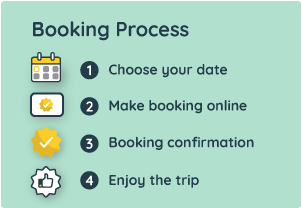 Pick-up time may be selected during the booking. Once boarded the cab, drive to Nandi hills, which is approximately 60-65 km from Bangalore city. Nandi hill is popular as a foggy hilltop that gives a panoramic view of the city and the landscape to as far as one can see. Enjoy breakfast/tea at a local restaurant atop Nandi Hills. Visit the popular attractions of the Nandi Hills - the Tipu’s Drop, a 600-meter high cliff face, Bhoganandeeshwara temple & Nandi statue. This temple complex is identified as one of the oldest temples of India. From Nandi Hills, start the drive to Lepakshi which is approximately 2 hours away. Stop for lunch as per your convenience. Visit the Lepakshi temple, Nagalinga, Nandi & monuments in the complex. Start the journey back to Bangalore from Lepakshi and get dropped back to the hotel/residence in Bangalore. The tour is expected to end 12 hours from your pick-up time.